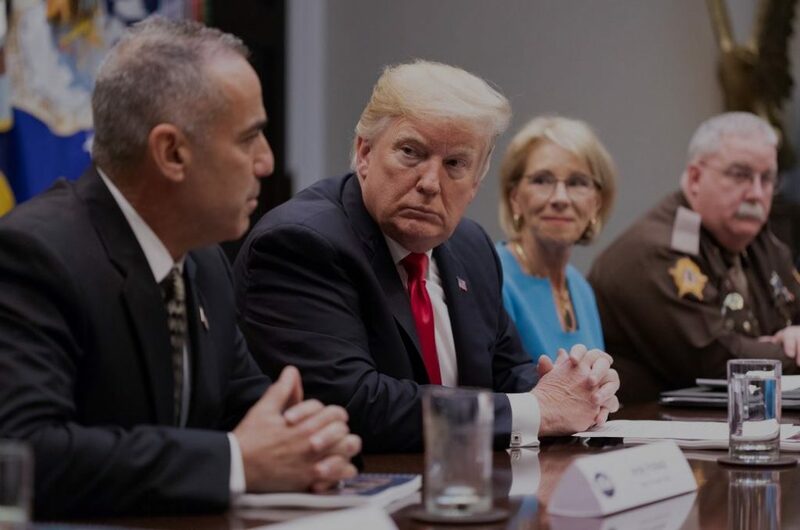 The Final Report of the Federal Commission on School Safety came out this week, and it has created quite a stir among educators and civil rights advocates. I’m just not sure the 180-page document will do much good. For those of you not familiar, the Commission was brought together after the high school shooting in Parkland, Florida. Secretary of Education Betsy DeVos was appointed to lead it, and other members included Secretary of Health and Human Services Alex Azar, Secretary of Homeland Security Kirstjen Nielsen and the Attorney General’s office (first, Attorney General Jeff Sessions, and now Attorney General Matthew Whitaker). 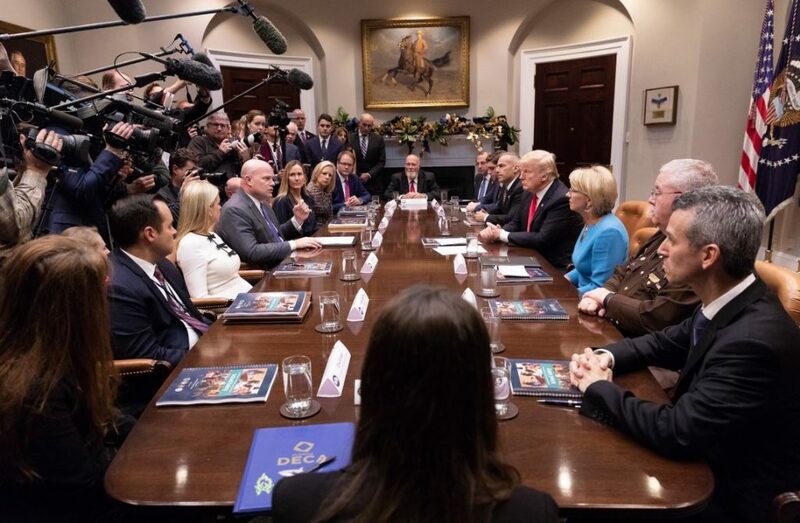 I agree with President Trump when he stated that “nothing is more important than protecting our nation’s children.” As such, the overall charge of the commission was to provide meaningful and actionable recommendations to keep students safe at school. I understand they (and their teams) spent hundreds of hours in this endeavor, and I am sincerely grateful for that time and effort. I was honored to have been invited to speak in front of the Commission in June to talk specifically about our research on cyberbullying, social media misuse, and school climate (my full formal remarks are here). I am always interested in debating the critical issues at hand, and absolutely welcome your feedback on the points I raised in my testimony as I believe an ongoing conversation about these issues is important. But for now, I want to weigh in with a few important statements about the final report. While I have thoughts on some of the other issues raised, for the purposes of this post I am going to focus only on the areas I was asked to provide insight on. First, the Commission asserted that states and local communities should “consider various approaches to school safety based on their own unique needs.” I realize that they want to empower schools to do what they think best, since they know their school population better than anyone. However, I would argue that such guidance isn’t very helpful at all, because state and local communities have been doing that for decades now, and school safety issues continue to be a major sticking point. If state and local communities could figure this out without strong, meaningful recommendations from the federal government, they would have done so a long time ago. Instead, I feel that the federal government must direct state and local communities with specific research-informed solutions. Second, they suggested that schools should work to improve internet safety measures. Even if schools had world-class firewalls and futuristic algorithm-based content monitoring systems in place, we all know that students are just using their phones to access pretty much whatever they want to online – and that cannot be systematically controlled. Plus, research has pointed out that monitoring doesn’t seem to differentiate those who cyberbully from those who don’t. Third, they recommend that schools partner with parents to improve internet safety measures. Schools and families must absolutely work together to convey a consistent set of expectations, behavioral norms, encouragement, and guidance. However, schools could use a lot more clarity in terms of how exactly to do this. Does this mean having more “parent night” presentations on bullying and cyberbullying and mental health and other adolescent problems? We all have been to some where there are barely five people in the audience, and four of those work at the school. Schools need more informed insight on how exactly to do this, especially with large populations of parents who are already “on tilt” related to school safety issues because of the tragedies we’ve had in our nation, as well as the specific difficult experiences their own child has endured. From our experience, incentivizing attendance through “parent honor rolls” or extra credit, tying parent trainings together with student award ceremonies, providing child care and a meal, or live-streaming the event are simple ways to reach more parents. Fourth, the report discusses (and appear to endorse) an increasing trend across states to criminalize bullying and cyberbullying. Every expert I’ve talked to share Justin’s and my perspective that this is a bad idea. Please see numerous blogs and documents we’ve written on this issue. I strongly feel that those who bully or cyberbully generally do not deserve to be placed on a trajectory that labels them as a juvenile delinquent or criminal, as that often becomes a self-fulfilling prophecy where they believe that everyone has given up on them. And, since bullying and cyberbullying are often behaviors performed spontaneously and/or are rooted in heavy, immediate emotions, students are not going to stop and think about the laws, policies, and punishments that will affect them. They simply act without consideration of the consequences, irrespective of how draconian they are. In addition, our published, peer-reviewed research is clear that first schools, then parents, and then lastly law enforcement have the strongest influence in deterring bullying and cyberbullying. Sixth, the commission encouraged states to provide more resources for schools to create positive school climates. This is also great and commendable. Justin and I wrote a book on the importance of school climate in preventing bullying, cyberbullying, and sexting, and since then we’ve been giving impassioned talks on the topic to major groups of educators multiple times a year because this is our heartbeat. I am thankful that the report provided a few important specific recommendations here, including: anonymous tip lines for students, student-led anti-bullying clubs, and building student ambassador programs. I have seen these initiatives work. However, I wanted the Commission to provide many more concrete suggestions, as well as specific guidance on how to enlist the help of all point persons across a school to translate these ideas into reality. Schools have ideas, but they also need symbolic and substantive support to consistently and faithfully implement programming throughout the entire school year, year after year after year. This is what is most strongly lacking. Overall, I will admit that it is easy for me to be critical of the report when I think about all that could have been discussed and prescribed. The big picture ideas were on point – and so my time in front of the panel was beneficial. I just very much wish that the macro was drilled down into the micro. Educators who work in your state, or district, or even local school know and understand the importance of the specific themes mentioned. They aren’t new, and they aren’t revolutionary. What they don’t know is which ones work best, how exactly to implement and manage them, how to get everyone on board to support them, and where in the world they will get the time, personnel, money, margin, and (often even) motivation to make them a reality. More funding – both for the research studies to illuminate specific, best practices and for the support staff and programming needed – would go a long way towards this end. (Unfortunately, in 2018 the government cancelled the only dedicated funding stream for school safety research). That is what is missing, and that is why I feel like schools are not much better off after this report. I feel like this was a major missed opportunity by the federal government. And now that the work of the Commission is done, everyone will be inclined to just move on with business as usual. And this report will be one of thousands of PDF files collecting cyber-dust on the ED.gov web site, instead of being a regularly-referenced and dog-eared resource on the desks of every school administrator across the nation. As I close, allow me to be prescriptive and to tangibly help you. When the Trump administration first took office, I fleshed out what the federal government should do by way of resilience programming, social norming, specific school climate efforts, positive behavior supports, social and relational skillsets, problem-solving and decision-making techniques, character education and emotional intelligence, and empathy training – and provided citations to research underscoring the importance of each of these. Please click on each of those above terms to be directed to what you can specifically do in your schools. In addition, we have covered these issues through numerous blogs, downloadable tip sheets, and in our numerous books. We’re happy to also assist you with input and resources to set them up and keep them going strong. Reach out at any time, and we will get you whatever you need. I continue to be quite pleased reading of the work that you have done, and continue to do, on behalf of students. Their safety should hold a much higher priority than it has in the past. Even in these and past times that seem to not have an effective ear to listen, you (and those who work alongside of you) continue to speak up and speak out. 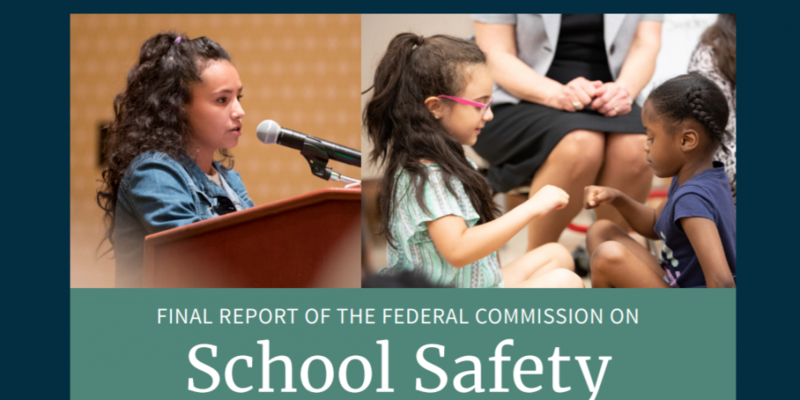 The final Report of the Federal Commission on School Safety is so short on being final, that it should be renamed. ‘The quickly put together, because we don’t want people to see us not appearing to be effective but being cold-hearted to children report on how we can quiet the voices screaming for school safety.’ Ok, it is too long, but it parallels how we who care honestly about children, feel after reading the report. Incentives are a must, more funding is a must, reliable research (which you provide) is available so I am at a loss as to why it is not at the forefront of the decision-making. How dedicated funding could be cancelled at this point in our history is mind-blowing. We chant that we need more, and the government allows for our children to receive less. Please never stop fighting for our children, their lives depend on us! I so appreciate you weighing in. We’re just growing tired of a lot of inertia. I absolutely believe that our government cares about our kids. I just feel that so much is so inefficient, or clouded by emotional decision-making instead of research-informed best practices, or rooted in old-school thinking that has not ever borne fruit. We will continue to work hard to fight the good fight and help as many youth-serving adults as possible with the specific prevention and response strategies they need. Our goal is meaningfully improving the online and offline well-being of our students and we will continue to spend our lives in this endeavor. Thank you again!